noted: A girl can change her mind.. So after much Macro yearning earlier in the week, i think i've come to my senses and realised that the lens I need to be replacing is my zoom... it's pretty pitiful and I desperately need something faster and probably with Image Stabilisation.... A monopod might give me a bit more of a chance, but I think it's time to get down to some serious saving! Anyhoo.... here's a really cool capture plus the glaringly obvious evidence all in one! 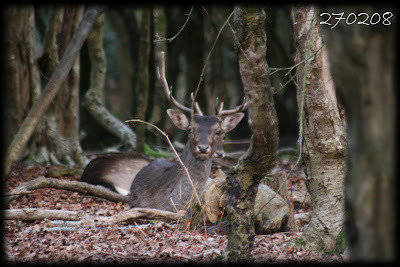 This is a Sika stag in the New Forest after work today. I feel fairly heroic that I managed to get any where near sharp at 1/25th second!!! Pretty impressive at 300mm!! He sat nice and still for me until 'someone' swore loudly about how rubbish their lens is, when he and his mates decided to make a run for it! Stealthy eh? !